Is It More Difficult To Get a Franchise Than To Get Into Harvard? According to The Washington Post's article by Rachel Siegel on June 7 2018, yup, it's easier to get into Harvard than get into a Chick-Fil-A franchise. Is this a commentary on our education system or is it about the fact that the American, capitalistic dream is still alive and well in the United States? With unemployment rates at a 50-year low, more people have jobs in America now than in recent history. However, people call me every day to get out of their job and into a franchise to create their own opportunity A franchise than work another day in a job they loath making someone else richer and having no control. Franchising is a clear way to change all that. With a great business, you can control your own destiny. It's a matter of finding a great concept that you can transfer your skill set into and then get satisfaction from building something on your terms. For many people, it's a second chance at making an impact for their family, community and the world, perhaps. A franchise is a business with training wheels. For many first-time business owners, that is a perfect scenario. The franchise company gives you a blue print for the business, training and ongoing support to help you be successful. There is not a better, safer way to go, in my opinion. However, as you choose a franchise you need to have your eyes wide open and understand the day to day operation and what your role will be. In addition, it's important to understand the legalities and restrictions of the franchise agreement. It is interesting to me that Chick-fil-a has such a high level of interest in participating in their business model. I assume most people looking at that business feel that it's like a McDonald's type of franchise business structure, but it's not. I consider Chick-fil-A a sort of hybrid franchise operation. There are a few concepts that execute this type of model. The essence of the business to grasp is that at Chick-fil-A, you are not a franchisee. You are more like a managing partner. You will invest $10,000 of your own money to manage one, single restaurant. It is essentially buying yourself a restaurant manager job. Chick-fil-A corporate pays for the real estate, construction and everything associated with the location. You manage the day to day operation, staffing, HR and food control. At the end, when it comes time to sell and retire, you have nothing to sell. It's not your business. In a traditional franchise, you keep the profits of what you have built. That is not important to everyone but for a true business owner, it is paramount. The Cathy family have built a wildly successful brand with this model. In my opinion, it's better than just hiring a restaurant manager which is pretty inexpensive as far as staff goes. Instead, they have a person in the store who is committed because he or she has skin in the game and in making a percentage of the profit. It's a win/win for everyone involved. 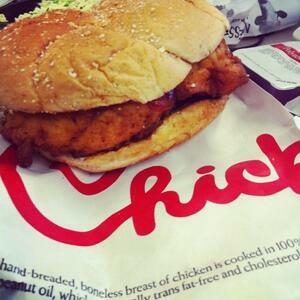 Watch my short video on 4 Things to Know About Chick-Fil-A.